This six passenger commercial stroller is a redesign based on Angeles’ classic red, Bye-Bye Buggy. 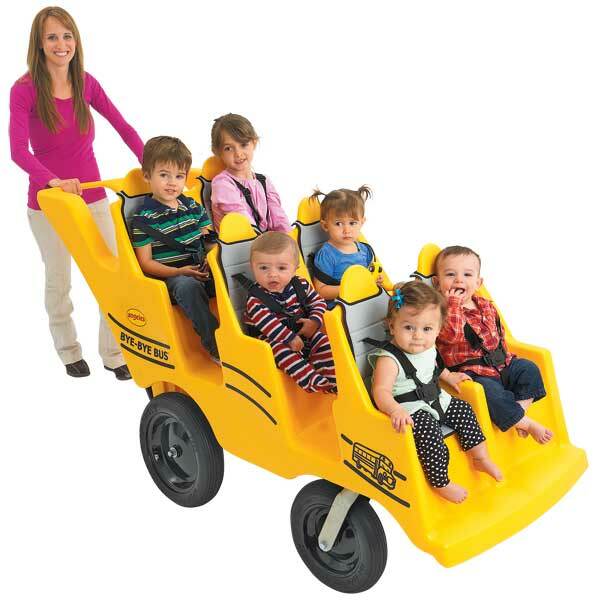 Child care centers across the country have embraced this updated stroller as demand for these new yellow buses are on the rise. 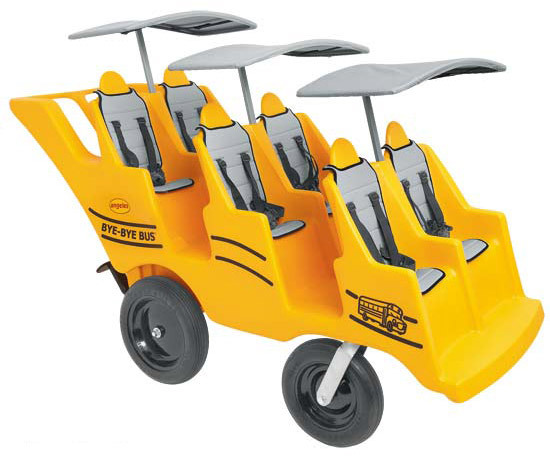 This new, eye-catching version is bright yellow with modern gray seat cushions, black harnesses, and graphics to resemble a school bus. The Bye-Bye Bus conveniently fits through standard doorways and the front wheels pivot 360 degrees for a great turn radius. This multi-child stroller has a built-in storage compartment for travel essentials, and a durable plastic unibody construction designed for the outdoor elements. Spokeless steel wheels with rubber fat tires make buggy easy to push, even on gravel and unpaved surfaces. Perfect for a quick visit to the local community garden or nature trail. Canopies are sold separate, but depending on where you stroll, these little shades can really help keep sun exposure to a minimum. You can order one, two or three canopies to cover just one or all of the terraced rows. The canopies are a gray textilene fabric that provide shade, but still breaths for good air circulation. Seats are terraced so that all children can see their world around them as they pass-by on their way to the park, or just out for some fresh air. 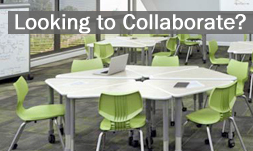 Each seat holds children up to 40 pounds or 40″ tall. An optional Infant-Soft Buggy Seat is available allowing newborns up to 5 month olds to tag along for the ride. 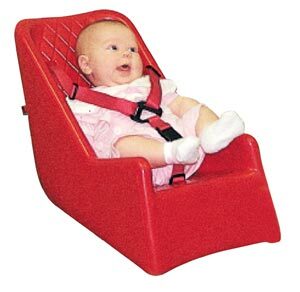 The infant seat is a soft molded seat that is quilted for comfort and has steel clips to hold seat securely in place in either the back or center rows. Safety features include a user friendly safety brake and safety seat belts. 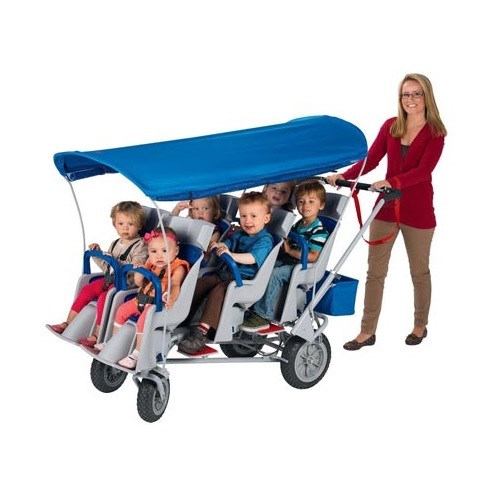 The classic Bye-Bye Buggy just celebrated it’s 25th year anniversary, so you know that these buggies are tried and true. Other commercial baby strollers from Angeles are available including their popular RunAbout stroller with included, removable sunshade. The RunAbout is available in 4 or 6 seat models and is currently on Sale! Spring is officially here and you, as well as your students, are ready to get outside and watch flowers bloom. These buggies typically ship out in less than two weeks, fully assembled, so you could be on your way out the door in no time. The Bye-Bye Bus is currently on sale. Contact Worthington Direct with any questions you have about commercial strollers or to secure a quote for a larger quantity. See you at the park!